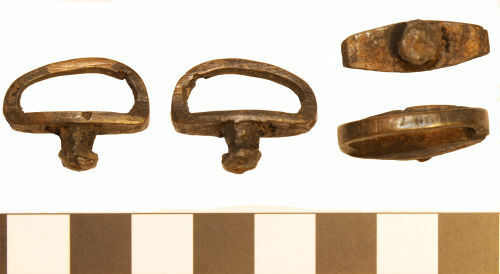 A copper-alloy loop, possibly an attachment loop from a shoulder belt phalera dating to the third century AD. The object comprises a flat, lentoidal plate. From the upper surface of this plate, there extends a semi-circular loop, which is rectangular in section. This loop is not symmetrical, being slightly distorted in shape at one side. Where it is distorted, there is also a small notch taken out of its inner edge, which may be a casting flaw or a deliberate modification. From the under side of the plate, there also extends a central, circular-section lug, which terminates in a flat circular end plate. The lentoidal plate measures 22mm in length and a maximum of 8mm in width. The loop measures 2mm in width and thickness and at its widest point is 10mm from the lentoidal plate. The lug measures 7mm in length and a maximum of 6mm in diameter. The end plate has a diameter of 6mm. It weighs 6g. See the illustrations of phalerae from Vimose, Carlisle and Saalburg (Bishop and Coulston 2009, 159, fig. 100) for examples of similar loops in situ on phalerae. There is also a close parallel for this loop in 3.693 from South Shields (Allason-Jones and Miket 1984, 208), Chesters (Chesters Museum 1444 (2968) Budge 1903, 386) and Aldborough (Bishop 1996, 67-68, SF 422 and Fig. 37). Another similar loop has also been recovered from the River Tees at Piercebridge (BM-B78D21) although this example has a trapezoidal loop.